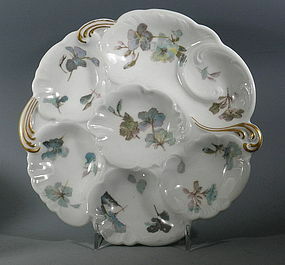 Limoges oyster plate with gold trim, In excellent condition, it measures 8.75" diameter. Marked on back "Limoges Haviland CFH GDM France". We have 3 of these lighter plates and 3 with same flowers but darker. We can sell individually or as a set of 6.